nothing is perfect , and all is improved. Anyway, I've added a big THANK YOU note in my repository (http://www.microlinux.fr/slackware/README.txt). The only thing that's left to do is correct a few typos, but that's all. This is what I call a 'dynamic blacklist'. But this do not solve the problem. If a repository add an upgraded package, slackpkg+ will not show it but the only in 'dirty' repository. Another feature to add should be a method to allow to show in dialog the packages presents in the all repository, not only packages as in the PRIORITY list. For now you can to see the hidden packages (becouse not the first in PRIORITY list) only by 'slackpkg search'. But this do not solve the problem. If a repository add an upgraded package, slackpkg+ will not show it but the only in 'dirty' repository. Unfortunatley slackpkg+ cannot be released before next mondey. zerouno I had a crack at something like this a while back. Uses "weighting" and seems to work reasonably well. I agree with others in that this is not really a required feature for slackpkg+ but it might be fun to play with anyway. And that's not true, Linux 3.4.68 was released on Nov 2013 while linux-3.9.11 was released on July 2013. So Linux 3.9.11 clearly is "smaller" (as in much older). BTW: The purpose of slackpkg (the original) is to compare the current installation to the reference image (the fully patched Slackware distribution) and display the differences. Packages with a "newer/better/whatever"version (installed from different sources) count as differences too, because they mave have bugs or security vulnerabilities not present in the fully patched Slackware distribution and the purpose of slackpkg is to upgrade the system to the official known-good state. So skipping over a package, because its version number is higher, clearly is an error. It leaves a package on the system, that doesn't belong there or maybe even harmful. 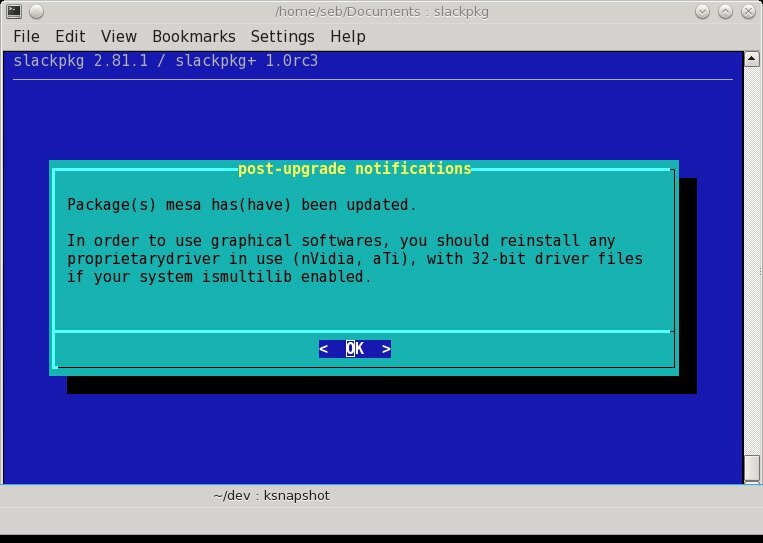 Example: Slackware 14.0 is available with LTS kernel 3.2.29. Now a security vulnerability is discovered and Slackware is patched to kernel 3.2.45. But the user upgraded to kernel 3.3.8, which is EOL and may have the vulnerability, too. Now a slackpkg+ with this version "weighting" would skip over kernel 3.3.8, because it's "newer", while in reality it's not. The tool can't tell the difference, because it doesn't know anything about Linux release cycles... Any software project with branching confuses these primitive version comparators. And trying to detect "alpha", "beta" and other strings doesn't change anything about it. If a tool is called slackpkg+ the basic semantics should be the same, otherwise it causes confusion. But it would still be considered an "upgrade" from the 3.4 branch to the 3.9 branch. No arguments from me here... and if you notice I said as much when I posted the code. I'd hate the idea of the package management deciding what is an "upgrade"
I have a new patch for slackpkg+ 1.0rc3. 1. I guess it is useful to have the slackpkg version number printed somewhere when running slackpkg. So, I added it right after slackpkg version. Note, this only works when DIALOG=on. Here is a screenshot. 2. For compat32pkg 1.5 I have implemented a feature that I called the triggers. To summarize, this is a mechanism that allows user to execute an action (print a message, execute a command) in response to an event. I (partially) added this feature into slackpkg+ so that user can map messages to events. When an event occurs, the message associated to it, if any, is printed, in a dialog when "DIALOG=on", on the standard output otherwise. NOTIFYMSG[on_upgrade@mesa. *,xorg-server]="The nvidia/amd driver need to be reinstalled !" When DIALOG=on, the messages are printed like that, otherwise the messages are printed like this. these patchs add documentation for the new variable NOTIFYMSG and include a message for the events "on_install@mesa. *,xorg-server" and "on_upgrade@mesa. *,xorg-server"
Last edited by phenixia2003; 11-09-2013 at 12:24 PM. [...]Just like the lack of dependency checks is a strength, not a weakness. I've seen that statement and variants thereof numerous times over the years and would appreciate any further elaboration on it. My primary working system is Linux from Scratch, as it has been for a decade or so, and Slackware is a close second in terms of time spent while computing. As a result, dependency checking and even keeping track of packages is something I'm accustomed to doing manually. So as someone who essentially rolls my own distro, I can see that point and don't need any persuasion. beneficial? This is not asked in an argumentative manner but only to get some points that buttress the assertion, especially for some of my colleagues who perceive dependency resolution as a "must have" feature. @ re_nelson: I couldn't say it better than ruario already did. Thank you! That's a very interesting read on the subject and the followup give and take in the comments section is worthwhile reading. Perhaps the one thing that most appeals to me concerning the Slackware philosophy is that there's not a split between the between the base package and the development package. I see this as an atomic item and never understood the division into the "-dev" or "-devel" packages. Of course, that may stem from my bias as a programmer and having been accustomed to building nearly everything on my primary system from source. IMHO, both Gentoo and FreeBSD get this aspect right in portage and ports. Last edited by re_nelson; 11-08-2013 at 03:32 PM. the idea is that isn't really explicit how to setup slackpkg+ to add multilib support. I tested it only a few (I do not use the alienbob multilib ). echo "Do you want install then multilib now? (y/N)"
echo "To install multilib type:"
echo "# slackpkg upgrade gcc glibc"
echo "# slackpkg remove multilib"
echo "# slackpkg install multilib"
echo "Remember... When you see NEW packages with 'slackpkg install-new' command,"
echo "you may need to install the related multilib package"
For better 32-bit support, packages are added to the multilib by Eric when required, but this is not limited to the -current tree. Furthermore, When new packages are added to the multilib, user has simply to run the command 'slackpkg update && slackpkg install multilib' to install them. $ slackpkg update && slackpkg install multilib"
In attachment you will find a screenshot to illustrate this. many typos are corrected in the current github version (that will be the 1.0 stable in two days). But not the typo I pointed out. The 1.0 version is freezed and the 1.0.x should contains only bugfix. To finish this post, I took the time to read other posts here, and I'm really disapointed that people are thinking there's only zerouno behind slackpkg+. The last patch I sent was and will be the last. Sorry, but I'm out of this. Last edited by phenixia2003; 11-15-2013 at 10:48 AM.